What Mark Did - A blog about what Mark has been doing. What else? A blog about what Mark has been doing. What else? I had need recently to use PHP to decrypt some short strings that were encrypted using the Blowfish algorithm. They were encrypted to HEX strings which necessitated converting them to strings. An added complication was that the mcrypt library in PHP is deprecated from version 7.3 onward and this code needs to function beyond that point. A couple of things to note are that the openssl_decrypt call requires a 16 byte key even though it only uses the first 8 bytes, the mcrypt_decrypt call also only uses the first 8 bytes of the key (but can also be safely passed an 8 byte key). Also you can see that RTRIM is used to get rid of any trailing \0 (NULL) or \4 (EOT) chars. It’s not unusual for there to be trailing characters as the encryption process pads out the text to be encrypted to a number of bytes that is evenly divisible by the encryption key. The data I’m decrypting here was originally encoded in an old VB6 application which padded out the string to be encrypted with EOT characters. The key shown in this code is NOT the key used to create the encoded HEX string as I’m keeping the actual key secret because it’s used in some commercial software. This entry was posted in php on April 6, 2018 by markn. Here’s a handy BSH script I use to upload files from my development server to the production server. Useful because it uses the –dry-run parameter as a default so you can easily make sure of what you’re going to break update before you actually do it. echo "Upload file to Production Server with Rsync"
rsync -v -u -a -r $dry_run --rsh=ssh --stats --progress  --exclude-from $exclude_file "$source_server" "$destination_server"
Some things to note here. Firstly, if you don’t want to have to enter your password for the remote server every time you’ll have to generate a SSH key for your development server and add it to the accepted keys file on the live server. Second, make sure you put the trailing slash on the source_server variable. Third, make sure your user has the permissions required for the destination folder and for the sake of all that’s holy don’t be doing this with your root user. This entry was posted in linux on March 26, 2018 by markn. It’s always handy to be able to easily list up WooCommerce products on eBay. I believe there are (mostly commercial) plugins that can automagically list items on eBay but in my case the products have a lot of custom meta data and needed a significant amount of logic applied to the product data before putting it up on the ole’ bay of E. So, time to dust of some of my HTML table coding kung-fu and develop something to suit my application. Where you put the code to generate your eBay listing an fill your template is up to you. In my case, I’m using the Storefront theme and most of the custom meta data I use is pulled and displayed on the product description tab. So, I decided that the best place for the store admins to generate the eBay listing would be on the store listing page for the product in question. Basically I need the system to be available when the admins are actually logged into WordPress, as a result we’ll need a conditional button that will get the HTML we require for our eBay listing. Then we’ll need a way of generating the HTML, and finally a way getting the HTML into the clipboard so it can be pasted into the eBay listing manager. The product description tab in the Storefront theme is available in /wp-content/themes/storefront/woocommerce/single-product/tabs/description.php. You can just drop a copy of this file in the same folder in the child theme and start working on it. You can find a cut-down copy of my code below, I’ve tried to comment it as thoroughly as possible. * This template can be overridden by copying it to yourtheme/woocommerce/single-product/tabs/description.php. * and displaying a button the user can click to the copy the HTML to the clipboard. * clipboard and used on eBay. I’m using the WooCommerce fields factory to record custom meta data against my products. You may be using some other method so the way you’ll pull your custom data may vary. This entry was posted in WooCommerce, WordPress on October 20, 2017 by markn. This method uses the input range object which can hold HTML values. It’s a HTML5 object and not supported in IE9 and earlier. The function is creating a new Range object, loading the content of the element we want to copy, clearing the current selection of all other ranges, adding the new range to the selection and then running execCommand(‘copy’) to put the contents into the clipboard. Here’s a variation I’ve used that creates an input field temporarily to hold the content we want to copy. This is useful as it has wider support that that used above as it doesn’t rely on the Range object. Care must be taken, however, to replace single quotes with ' before putting content into the value attribute of the input. This entry was posted in Software on October 20, 2017 by markn. This is the first entry written on the new home of this blog, a 1GB Linode server. I moved it here from a Pair account that I am in the process of closing. The server is running Ubuntu Server 16.04 LTS, Apache, MySQL, and PHP 7. It looks like Apache defaults to using /var/www as the web root. I prefer using /srv/www. To enable this open up /etc/apache2/apache.conf, comment out the section and uncomment the section. Make sure to change the AllowOverride directive to All or .htaccess and mod_rewrite won’t work. You need to make sure that the AllowOverride directive is setup as per above. Then just enable the mod with a2enmod rewrite. PHP7 is installed fairly easily with sudo apt-get install php7.0 php7.0-fpm php7.0-mysql. Note that 775 is used because we need www-data and a ftp user to be able to modify the WordPress install. The extraction will create the folder to put the contents in. Zip up WordPress install folder. Dump database using MySQL Dump or phpMySQL. Remember to add use database_name; to start of MySQL Dump file. Transfer install folder and MySQL dump to new server using SFTP. Unzip WordPress tar.gz file to /srv. Edit the /srv/domain_name/wp-config.php file to enter new database details and login. Create new /srv/domain_name-logs/ folder for Apache logs and set www-data as the owner. Set permissions on WordPress folders as covered earlier. Make entry into /etc/hosts file for 127.0.0.1 site_name. Create /etc/apache2/sites-available/site_name.com.conf file making sure to set the web root and log file path correctly. Enable the site with a2ensite site_name.com.conf. Test by setting your local machine’s hosts file for the domain to the server IP address. Setup the new DNS Zone on Linode for the site. Adjust the Name Servers at the domain registrar for the domain. Wait for the DNS records to propagate! This entry was posted in linux, web servers, WordPress on August 23, 2017 by markn. I’ve just finished a few hours of fun messing up a multi domain SSL certificate renewal. In the first draft of this entry I did not use the word mess, messing, or messery. I used another four letter word, but since then I’ve settled a bit and have come back and edited out the profanity. I managed to un-mess it today so in the interests of not performing the same messery at some point in the future here’s what I need to do next time. The Namecheap Multi-Domain PositiveSSL certificate requires you to have a certificate for the non-www and the www versions of a domain. In fact, it requires you to have one for each sub-domain of a parent domain you want to secure. If renewing the SSL certificate then you should generate a new CSR file. Make extra sure to use the non www version of the domain as the primary domain. Using the Namecheap HTTP DCV validation method is dead simple but make sure to read the instructions carefully as they can (and have) changed the folder they want the validation file uploaded to. It was just the root folder but just a few weeks later they wanted it in the ./well-known/pki-validation/ folder. What the?! Now, I am not 100% sure if the ServerName/ServerAdmin/ServerAlias/DocumentRoot entries need to be duplicated. But until this point it’s never broken anything so no harm done. The key point of this is that because the SSL handshake is the very first thing that happens between a client the web-server you absolutely 100% need a SSL certicate for the www subdomain as well as the main domain. There’s no getting around it with redirects in .htaccess or any other such trickery. This entry was posted in linux, web servers on August 17, 2017 by markn. Then restart MySQL with sudo service mysql restart and you’ll be able to create date and datetime fields with a zero default value. This entry was posted in linux, web servers on July 31, 2017 by markn. WooCommerce does have ‘attributes’ available for products but like most things in WC these are tailored for users selling clothing and various other consumer products. In my application each product is unique and once sold gone forever. Each product has common characteristics though, such as year of manufacture, metal it is made from, and where it was manufactured. As a matter of course the user of the WooCommerce store wanted to define a set of characteristics that would be entered when a new product was created and then wanted those characteristics displayed in the product listing. A good solution was arrived at through the use of the WooCommerce Fields Factory plugin and modifying the Storefront Single Product->Tabs->description.php template. The WC Fields Factory plugin allows you to add custom fields to your WooCommerce products. It has the added benefit of allowing you to display those fields on the admin side where they can be edited at the product level by your shop admins. Nifty. 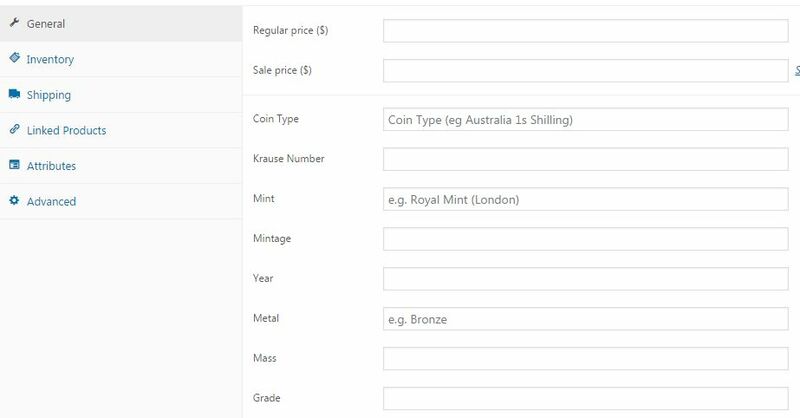 In my application I created a group of Admin Fields called “Coin Attributes” and then populated the group with the fields that the customer wanted for their products. Of course where exactly you echo out the data in the TABS template is up to you and determined by how your product pages are laid out. This entry was posted in php, WordPress on March 16, 2017 by markn. If you’re using WooCommerce and selling one-off products you don’t necessarily want to use the default terminology for sold out products. You might want to hide the sold price and remove the WooCommerce “In Stock” messages that are better suited to sites selling t-shirts and so on. Removing the stock availability messages is simple enough using the woocommerce_get_availability filter. Couldn’t be any simpler, just set the availability text to an empty string. Presto chango those messages are gone. Replacing the price with SOLD when a product is sold is almost as simple, it just requires hooking into a couple more filters. This entry was posted in php, WordPress on March 15, 2017 by markn. I happen to like web stores that have contact details in prominent locations so it’s useful to be able to add phone numbers to the header of a site using WooCommerce. In my particular application I’m using the Storefront theme. Firstly you need a bit of CSS in your child theme’s style.css file. Your widths might be different and I’ve adjusted the margin of the site-search div to compress things a bit. Then you can use the storefront_header action to insert some code into the header. To set the priority of the insertion have a look at the storefront header.php file. In my case I wanted the new HTML in between storefront_product_search and storefront_primary_navigation_wrapper so I set the priority to land in between those two. Need Software Development in Adelaide?